This National Park consists of a mountain range of the Apennines -exceeding 2000 meters above sea level at Vettore- and small towns, “borghi”, hermitages, abbeys and fortresses spread over its slopes. In this magic territory nature is luxuriant, ancient legends survive and time seems to come to a stands stillThe National Park of Monti Sibillini covers an area of ​​about 71 437 hectares, and extends between the regions of Marche,Umbria, falling out of the four provinces of Ascoli Piceno, Fermo, Macerata and Perugia.The predominant landscape is that of the limestone massif of the chain of the Apennines, which in this area acts as an interface between the softer forms part of the Tuscan-Emilian and maximum heights of Abruzzo.The park is characterized by a great variety of landscapes and natural environments. The valley bottoms of rivers and streams are divided into narrow gorges and impressive (such as the impressive Gola dell’Infernaccio), created by the telluric activity and erosion. The higher number of forests (mainly beech) will encircle the crown of the Apennine valleys with prevailing north-south trend. 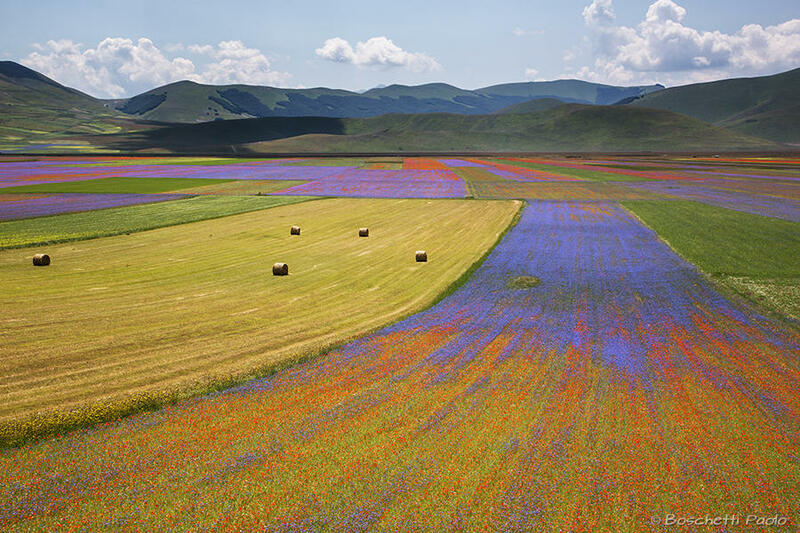 The western side slopes gently toward the Umbria with a successive series of depressions at high altitude, the famous Piani di Castelluccio. In the park visitors can enjoy many sports activities (trekking, free-climbing, paragliding, rafting, mountain bike tours) or discover many local products (cheese, honey, truffles, mushrooms, chestnuts, legumes, bread and traditional local liquors). At 314 m altitude, on one of the hills that separates the valleys of the Potenza and Chienti rivers, the town stills conserves part of its 14th century wall. A walking tour will bring you to the Porta Montana, the Church of Santa Maria della Porta, the five-arched Fonte Maggiore in the centre built in 1326. Don’t miss the elegant Loggia dei Mercanti, San Giorgio church and the cathedral, both by Cosimo Morelli, and the small basilica of the Madonna della Misericordia, set between more recent buildings, dating back to 1497 but with the interior and facade completely restored with balanced refinement by Vanvitelli (1742). Macerata offers charming hill town scenery and one of Italy’s most famous opera festivals and several days’ worth of sights. While the Picena tribe settled the area as a trading centre 3000 years ago, its largest draw these days is the Arena Sferisterio, which holds the opera festival in July and August. The “Conero Riviera” takes its name from the slopes of Monte Conero promontory (first Marche’s National Park 572 meters high). The Riviera is an alternating hidden beaches and rocky cliffs over the sea that can, most of the time, only be reached by walking along small paths or by boat. In this area a panoramic road that plunges into the depths of Mediterranean maquis, first leads to Portonovo Bay and then to Sirolo, a small village perched over the sea, Numana and Marcelli. South of Conero the coast once again becomes flat towards the seaside resort of Porto Sant’Elpidio, the “Green Picene Riviera”.